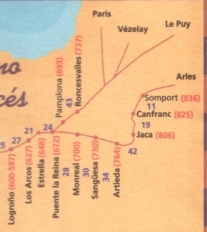 Well some of my friends know I´m walking the pilgrim route and for others it will be a complete surprise, and there are probably some who can´t believe I´ll actually complete the 840 kms (500 miles). Here I am in Jaca having completed the first real day of the Camino, though yesterday could count as a prologue. Having stayed with my friend Sue in London I had to get myself from Crouch End to Stantsted at 6 am to take the flight to Zaragoza (flying over Winchester - Danebury just visible in the distance, Andover easier to pick out, couldn´t quite see home, cloudy over Brittanny so missed Le Yaudet and then over the Basque country and down the Ebro valley past Cerromolino). So having done the tour of Barry´s digs arrived in Zaragoza on time and headed for the railway station - a piece of interesting modern architecture placed alongside the old railway station, which was dwarfed by it. I then took the train to Canfranc - a single carriage rumbly-bumbly train for a 4 hour journey. The landscape around Zaragoza is fairly monotonous low white hills of clay, when you get out of the Ebro valley. However it was livened up by about 30 eagles (or similar) circling round over the town of Villanueva de Gallego (I think that was the place). Once past the city of Huesca, the country became more interesting and mountainous with many more eagles flying off the shear cliffs alongside the river valley. The train gradually wound its way up the foothills into the Pyrenees, which are much more gentle and wooded than the craggy mountains I'm used to in Leon. The final section of track from Jaca was very steep and the railway track wound through forests and in and out of tunnels terminating at Canfranc Estación (it originally continued through to France, but part of the track collapsed on the French side many years ago and was never repaired so the trains go no further). Apart from the amazing old, grandiose, art deco but sadly very dilapidated station, this part of Canfranc is all modern, very unpreposssessing and appeared to be totally dormant (everything closed for holdiays between the winter ski season and the summer hiking season). 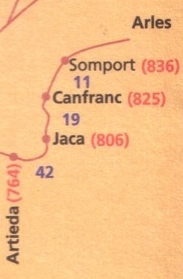 Unlike other pilgrims, who had arrived on the train and were clearly planning to go up to Somport and start at the border, I thought Canfranc Estación was a good a place as any to start from and decided to set out right away. I had already thought about walking to Canfranc pueblo (the old town, which had been abandoned to some extent after a serious fire that swept through the village) as that is only a few miles, sounded nicer and there was supposed to be a refugio there. It was a lovely evening for walking, the Camino running alongside the Rio Aragon, passing waterfalls, crossing the river over medieval bridges. However I reached Canfranc to find the refugio closed and so had no choice but to go on to the next village of Villanua. The disadvantage of this was that it was now about 8.30 and though there was probably another hour of daylight, I was sure it was further than I had already walked though I was told it was only 4 km. So I set off hoping all would be well. The camino continued alongside the river winding around the mountainsides: the scenery was beautiful, but as the light faded I became concerned that I´d make it to Villanua as it became increasingly difficult to spot the yellow arrows that mark the route and I could make out, only just, the magnificent scenery of the river flowing through a deep ravine alongside the path (this is not a scenario the H&S executive would approve of). I was sorry not to be able to appreciate what must have been a spectacular section to see in daylight and mildly worried that I would disappear over the edge. Just as I was wondering whether I´d be able to see/feel my way, the path broadened into something more substantial and I realised I must be on the remains of the Roman road (from Bordeaux to Zaragoza) so I was disappointed not to be able to actually see it, but my feet appreciated it and I made it to Villanua at about 10 or 10.30 pm. As i reached the village some locals out for a late paseo directe me to the Albergue Triton and dropped into bed, trying not to disturb the other two pilgrims. All the albergues and refugios for pilgrims are dormitory accommodation so my lack of a watch was no problem as others were waking with the dawn. I set off in the cool and shade of the mountainside following the river all the way. There was one village en route Castiello de Jaca, set on a hill with a little Romanesque church at the summit. The church was undergoing restoration so I only saw the outside. Stopped at the bar here for a rest and refreshment before continuing to Jaca. Just out of Castiello the route crossed the river on a series of stepping stones (Alexander would have loved it). Fortunately the river is low so I could use the lower set of stones which were more even - I wouldn´t like to try this with the river in full flood on the higher stones which were about 2 - 3 ft high and rather more uneven. Any other spring I would have probably have had to use the upper set, but it was apparent that the rivers and streams were unexpectedly low and I soon discovered that Aragon was suffering serious drought because of the dry winter and spring. By this time the sun was well up and there was no more shade from the mountainside and I was beginning to wilt in the unaccustomed heat. I was certainly going quite slowly in the final few kms to Jaca, but got here and found the Albergue de Peregrinos didn´t open till 5. Jaca is a small city, similar in size to Salisbury and set on a hill averlooking the rio Aragon. The town was crowded and chaotic as they had been celebrating a fiesta Cristianos v. Moros, and I just wanted somewhere quiet to collapse. So I took the opportunity to visit the Cathedral, a beautiful Romanesque building, but it shut for siesta at 2 so I had to go and find a bar to sit in and recovered sufficiently to go for another wander round the town, see the Ciudadela (pentagonal fortress) built by Phillip II and came across this internet cafe just as it was opening, so thought I´d take advantage of it as the next towns are all rather smaller and it may be a few days before I can get on with part 2. When I got back to the hostel it was almost full and I was about the last to arrive. This was another of the authoritarian variety, though I didn't realise it at the time, being the first pilgrim's hostel I stayed at and had nothing to compare it to. I was issued with a ticket with my bed number and left to find my way round. Here I started the routine ritual of showering, followed by washing of clothes that was the prelude to every stay at every hostel however tired or sore your feet.Once I felt a little more human I returned to the Medieval market that accompanied the fiesta to buy a straw hat, obtained some batteries for my alarm clock (not that I ever needed the alarm) and found a bar for supper. I also had to go to the pilgrim's church of Santiago to obtain my credencial, which I would need to show I was a genuine pilgrim allowing me to use the pilgrim hostels on the Camino. I stopped at the church to attend mass, which was followed at the end by blessing of any pilgrims present. There were three of us who were called forward to the front of the church to recieve the blessing. 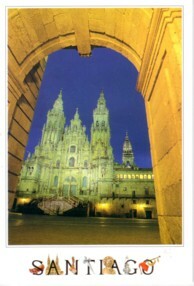 One of the others was a German man, whom I saw off and on along the Camino. I think I did discover his name at one stage, but can't remember it now. I also had my first encounter with mad Axel at Jaca. I returned to the hostel thinking I would have an early night (well 10pm seemed early but rapidly became the norm - often even 9pm). Well I found this Frenchman happily chatting to all and sundry whether they spoke French or not, though there were quite a few other French there also. As he was occupying the bed adjacent to me and clearly had no intention of settling down for ages I decided to move along to one of the empty beds, in spite of the strict numbering system. When he finally went to bed he was exclaiming to anyone who would listen, that his neighbour had abandoned them, apparently thinking I had set out on the next stage of the camino, rather than just moving a few beds along! I ended up in the same hostel as him thoughout much of the Aragonés route and though he was considerably more cheerful than some of the French I encountered, he was rather exhausting in his monologues and tirades! Especially as I could usually only understand one word in three on average! Well I finally fell asleep in spite of the Spaniards enjoying their fiesta with usual fireworks. I´m hoping that like digging the first 3 days are the most exhausting, but after that you get used to it. So no chance of me giving up yet - there´s another stretch of Roman road coming up, which I´ll make sure I see in daylight.